DIE Sabbati, videlicet, 13 die Augusti. Letter to the Earl of Bedford, about the Marquis of Hertford. Gentleman Usher's Bill for extraordinary Expences. Sir Thomas Dawes's Bill; and a Declaration about the King's Proclamation, concerning the Earl of Essex. Sent back to the H. C.
Mr. Strode's Letter to the Earl of Bedford, that the Marquis of Hertford is at Sherborne. Message from the H. C. to impeach the Marquis of Hertford, Earl of Northampton, and Mr. Hastings. Proclamation-Writs to be issued for their Appearance. Letter from Henley on Thames, with a circular Letter sent round the County by the Commissioners of Array. Circular Letter from the Commissioners of Array for Oxfordshire. Order for the Deputy Lieutenants to prevent them from putting their Commission in Execution. Report of Mr. Maxwell's, the Gentleman Usher's, Bill, for extraordinary Expences. Declaration in Answer to the King's Proclamation, about the Earl of Essex, and his Officers, &c.
Lord Kymbolton, Speaker this Day. Ordered, That this House will take into Consideration the Judgement against the Lord George Digby on Tuesday next. 1. An Act concerning Sir Tho. Dawes, &c.
2. A Declaration, concerning the King's late Proclamation, touching the Earl of Essex and others. 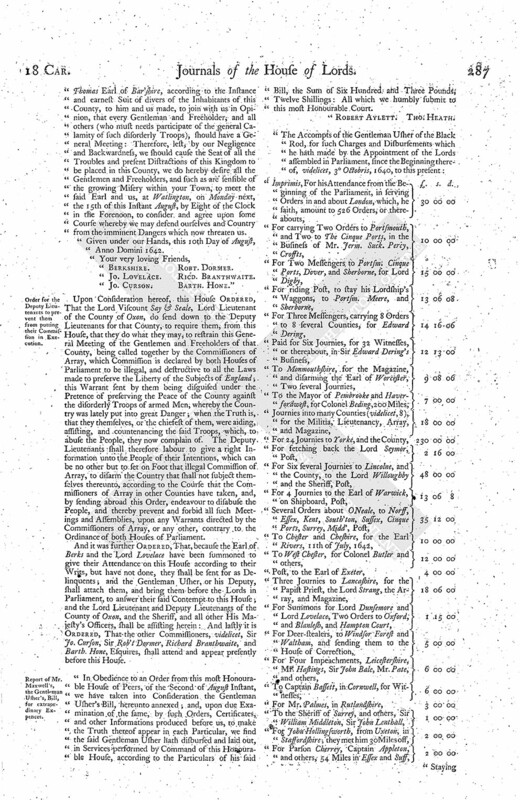 The House, taking this Declaration into Consideration, made some Amendments and Alterations in it, and sent it down, by Message, to the House of Commons, by Doctor Aylett and Doctor Heath, to let them know, that this House agrees to the said Declaration, with the Amendments and Additions. The rest of this Report is to be made on Monday next. A Message was brought from the House of Commons, by Sir Robt. Harley, Knight of the Bath; who said, "He was commanded, by the Knights, Citizens, and Burgesses of the House of Commons, in their Name, and of all the Commons of England, to accuse, and did accuse, Wm. Marquis Hertford, Spencer Earl of North'ton, Henry Hastings, Esquire, Second Son to the Earl of Huntingdon, of High Treason, for actual levying War against the King and Kingdom; and desired that speedy Proceedings may be had against them, as to Law and Justice shall appertain." Ordered, That the Clerk of the Crown shall issue forth Proclamation-Writs, directed to the Sheriffs, to summon Wm. Marquis Hertford, Spencer Earl of North'ton, and Henry Hastings, to appear before the Lords in Parliament, on the 29th of this Instant August, to answer to their Impeachment of High Treason, sub Pœna Convictionis. That this House will appoint a speedy Day to proceed against them. Henley on Thames, Aug. 12, 1642. "Out of a hearty Sense of the great Peril we have escaped, through God's Mercy, by the passing to and through our County of certain disorderly Trains of armed Men, whereby a very great Damage (if not Desolation) might generally have prevailed upon us; it hath therefore pleased the Right (fn. 1) Honourable Thomas Earl of Bar'shire, according to the Instance and earnest Suit of divers of the Inhabitants of this County, to him and us made, to join with us in Opinion, that every Gentleman and Freeholder, and all others (who must needs participate of the general Calamity of such disorderly Troops), should have a General Meeting: Therefore, lest, by our Negligence and Backwardness, we should cause the Seat of all the Troubles and present Distractions of this Kingdom to be placed in this County, we do hereby desire all the Gentlemen and Freeholders, and such as are sensible of the growing Misery within your Town, to meet the said Earl and us, at Watlington, on Monday next, the 15th of this Instant August, by Eight of the Clock in the Forenoon, to consider and agree upon some Course whereby we may defend ourselves and Country from the imminent Dangers which now threaten us. Given under our Hands, this 10th Day of August, Anno Domini 1642. Upon Consideration hereof, this House Ordered, That the Lord Viscount Say & Seale, Lord Lieutenant of the County of Oxon, do send down to the Deputy Lieutenants for that County, to require them, from this House, that they do what they may, to restrain this General Meeting of the Gentlemen and Freeholders of that County, being called together by the Commissioners of Array, which Commission is declared by both Houses of Parliament to be illegal, and destructive to all the Laws made to preserve the Liberty of the Subjects of England; this Warrant sent by them being disguised under the Pretence of preserving the Peace of the County against the disorderly Troops of armed Men; whereby the Country was lately put into great Danger; when the Truth is, that they themselves, or the chiefest of them, were aiding, assisting, and countenancing the said Troops, which, to abuse the People, they now complain of. The Deputy Lieutenants shall therefore labour to give a right Information unto the People of their Intentions, which can be no other but to set on Foot that illegal Commission of Array, to disarm the Country that shall not subject themselves thereunto, according to the Course that the Commissioners of Array in other Counties have taken, and, by sending abroad this Order, endeavour to disabuse the People, and thereby prevent and forbid all such Meetings and Assemblies, upon any Warrants directed by the Commissioners of Array, or any other, contrary to the Ordinance of both Houses of Parliament. And it was further Ordered, That, because the Earl of Berks and the Lord Lovelace have been summoned to give their Attendance on this House according to their Writs, but have not done, they shall be sent for as Delinquents; and the Gentleman Usher, or his Deputy, shall attach them, and bring them before the Lords in Parliament, to answer their said Contempt to this House; and the Lord Lieutenant and Deputy Lieutenants of the County of Oxon, and the Sheriff, and all other His Majesty's Officers, shall be assisting herein: And lastly it is Ordered, That the other Commissioners, videlicet, Sir Jo. Curson, Sir Rob't Dormer, Richard Branthwaite, and Barth. Hone, Esquires, shall attend and appear presently before this House. "In Obedience to an Order from this most Honourable House of Peers, of the Second of August Instant, we have taken into Consideration the Gentleman Usher's Bill, hereunto annexed; and, upon due Examination of the same, by such Orders, Certificates, and other Informations produced before us, to make the Truth thereof appear in each Particular, we find the said Gentleman Usher hath disbursed and laid out, in Services performed by Command of this Honourable House, according to the Particulars of his said Bill, the Sum of Six Hundred and Three Pounds, Twelve Shillings: All which we humbly submit to this most Honourable Court. 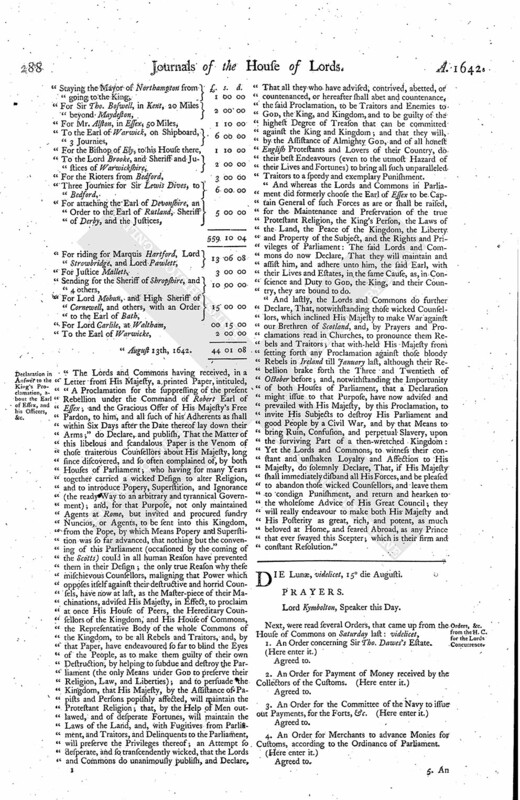 "The Lords and Commons having received, in a Letter from His Majesty, a printed Paper, intituled, "A Proclamation for the suppressing of the present Rebellion under the Command of Robert Earl of Essex; and the Gracious Offer of His Majesty's Free Pardon, to him, and all such of his Adherents as shall within Six Days after the Date thereof lay down their Arms;" do Declare, and publish, That the Matter of this libelous and scandalous Paper is the Venom of those traiterous Counsellors about His Majesty, long since discovered, and so often complained of, by both Houses of Parliament; who having for many Years together carried a wicked Design to alter Religion, and to introduce Popery, Superstition, and Ignorance (the ready Way to an arbitrary and tyrannical Government); and, for that Purpose, not only maintained Agents at Rome, but invited and procured sundry Nuncios, or Agents, to be sent into this Kingdom, from the Pope, by which Means Popery and Superstition was so far advanced, that nothing but the convening of this Parliament (occasioned by the coming of the Scotts) could in all human Reason have prevented them in their Design; the only true Reason why these mischievous Counsellors, maligning that Power which opposes itself against their destructive and horrid Counsels, have now at last, as the Master-piece of their Machinations, advised His Majesty, in Effect, to proclaim at once His House of Peers, the Hereditary Counsellors of the Kingdom, and His House of Commons, the Representative Body of the whole Commons of the Kingdom, to be all Rebels and Traitors, and, by that Paper, have endeavoured so far to blind the Eyes of the People, as to make them guilty of their own Destruction, by helping to subdue and destroy the Parliament (the only Means under God to preserve their Religion, Law, and Liberties); and to persuade the Kingdom, that His Majesty, by the Assistance of Papists and Persons popishly affected, will maintain the Protestant Religion; that, by the Help of Men outlawed, and of desperate Fortunes, will maintain the Laws of the Land, and, with Fugitives from Parliament, and Traitors, and Delinquents to the Parliament, will preserve the Privileges thereof; an Attempt so desperate, and so transcendently wicked, that the Lords and Commons do unanimously publish, and Declare, That all they who have advised, contrived, abetted, or countenanced, or hereafter shall abet and countenance, the said Proclamation, to be Traitors and Enemies to God, the King, and Kingdom, and to be guilty of the highest Degree of Treason that can be committed against the King and Kingdom; and that they will, by the Assistance of Almighty God, and of all honest English Protestants and Lovers of their Country, do their best Endeavours (even to the utmost Hazard of their Lives and Fortunes) to bring all such unparalleled Traitors to a speedy and exemplary Punishment. 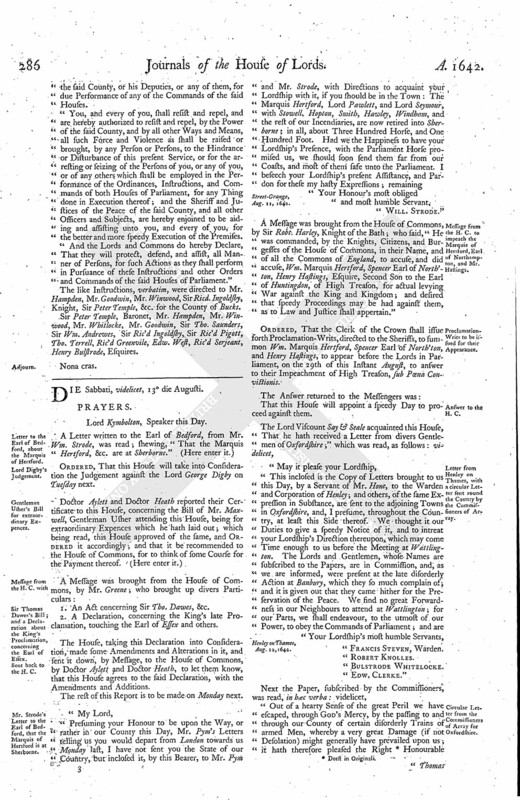 "And whereas the Lords and Commons in Parliament did formerly choose the Earl of Essex to be Captain General of such Forces as are or shall be raised, for the Maintenance and Preservation of the true Protestant Religion, the King's Person, the Laws of the Land, the Peace of the Kingdom, the Liberty and Property of the Subject, and the Rights and Privileges of Parliament: The said Lords and Commons do now Declare, That they will maintain and assist him, and adhere unto him, the said Earl, with their Lives and Estates, in the same Cause, as, in Conscience and Duty to God, the King, and their Country, they are bound to do. "And lastly, the Lords and Commons do further Declare, That, notwithstanding those wicked Counsellors, which inclined His Majesty to make War against our Brethren of Scotland, and, by Prayers and Proclamations read in Churches, to pronounce them Rebels and Traitors; that with-held His Majesty from setting forth any Proclamation against those bloody Rebels in Ireland till January last, although their Rebellion brake forth the Three and Twentieth of October before; and, notwithstanding the Importunity of both Houses of Parliament, that a Declaration might issue to that Purpose, have now advised and prevailed with His Majesty, by this Proclamation, to invite His Subjects to destroy His Parliament and good People by a Civil War, and by that Means to bring Ruin, Confusion, and perpetual Slavery, upon the surviving Part of a then-wretched Kingdom: Yet the Lords and Commons, to witness their constant and unshaken Loyalty and Affection to His Majesty, do solemnly Declare, That, if His Majesty shall immediately disband all His Forces, and be pleased to abandon those wicked Counsellors, and leave them to condign Punishment, and return and hearken to the wholesome Advice of His Great Council; they will really endeavour to make both His Majesty and His Posterity as great, rich, and potent, as much beloved at Home, and feared Abroad, as any Prince that ever swayed this Scepter; which is their firm and constant Resolution."